Nothing is more stressful than losing your job and watching the bills pile up. It isn’t long before your bank account balance plummets, the collection companies start to call, and you feel like you’re drowning in debt. Don’t panic. You can keep your head above water and your bank accounts out of the negative. Here’s how. 1. Make job-hunting your full-time job. Generating an income is your number one priority and the best solution for your financial woes. It may be difficult to find a job in your area of expertise, and it may be even harder to replace a sizeable income in this economy, but that does not mean you can simply wave a white flag and surrender. Take what you can get. Desperate times call for desperate measures. Stop holding out for that management position or dream career. A job flipping burgers, cleaning floors, or raking lawns is better than no job at all. And the money will keep the electricity on and the repo man at bay. Go part time. A part-time job is also better than no job. Many people juggle two or more part-time jobs to meet their financial obligations. Looking for work is a full-time job. Until you are working a full-time job, you do not have “spare” time. You need to keep handing out resumes, applying to job sites, and combing job boards until you are back on your feet again. Which debts are a priority? If you have any “secured” debt, meaning that the creditor has the right to repossess an asset for non-payment, you will want to keep those up-to-date. The last thing you need is to have your home go into foreclosure or your car repossessed. You will also need to ensure that the things you need to survive such as electricity, heat, and food are covered. Also, consider paying off the items with high interest rates like credit cards. 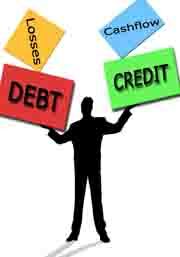 These outstanding balances can turn into massive debts if left unpaid. Contact your creditors before your accounts slip into arrears. You may be able to negotiate lower payments, lower interest rates, or deferred payments–any of which will help you stay current on your financial obligations and prevent further stress. If you wait until you have become delinquent, they may be less receptive to your request for help. Contact your unemployment office the minute you find yourself out of work. The sooner you get your paper work completed and the wheels in motion, the sooner you will receive your benefits. These funds will definitely help keep food on the table while you conduct your job search. Begin by separating your necessities from the expenses that you can survive without. For instance, you need heat, but you don’t need satellite TV. Next, devise a budge based on these necessities and stick to it. Eliminate extra expenses until you are back on your feet again and, then, introduce them gradually. You may find that you don’t need some of them after all. And don’t put extras on credit cards. A mounting credit card debt can be disastrous–growing rapidly due to high interest rates. Snipping your credit cards in half would be the best move. Unemployment is stressful. Unemployment coupled with debt can feel like an insurmountable burden. So don’t let your debt drag you down to the depths of despair. By sticking to a plan, being proactive, and never losing hope, you can return to financial viability–and restore your satellite TV. What measures did you take to stay afloat during your unemployment? Kimberley Laws is a freelance writer and avid blogger. She has written on a wide range of topics including social media marketing, Reputation.com, and WordPress plugins. Definitely cut your budget. I’m sure there is some sort of “emergency budget” that you could switch to if times were tough. Cut out anything that you don’t need at the time being. Grab your umbrella! It’s time to dig into your rainy-day fund. Sudden unemployment is a prime reason to start putting money away in an Emergency Fund. Even if it’s $50-$100 per month in a high interest savings account. The more money you have at your disposal during life’s rough patches, the more options you’ll have.